Visiting the Herbert Hoover National Historic Site allows visitors to step back in history and get to know Iowa’s only contribution to President of the United States of America. 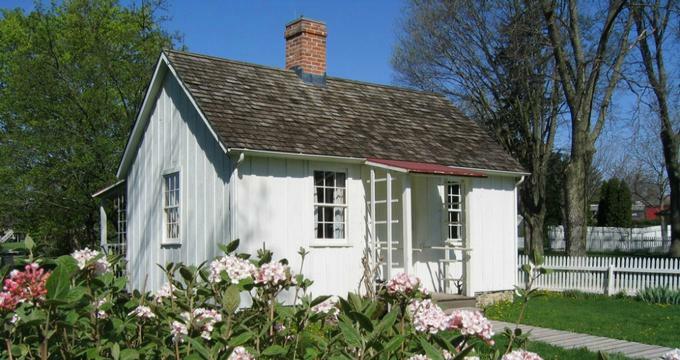 Come and see his childhood home, enjoy the tallgrass prairie and wander around the Presidential Library and Museum to get a sense of who he was as a man and as the leader of the country. The Herbert Hoover National Historic Site is located within steps of the 31st POTUS' (and Iowa’s only President) childhood home. This Historic Landmark was built in 1965, and sits on just under 200 acres and is managed by the National Parks Service and their many park rangers. Many of the buildings onsite are either restored or reconstructed from their original location and architecture. An incredible sculpture was given to President Hoover as a gift, in tribute to his leadership during wartime, and it stands on-site as a perception of Isis, an Egyptian deity. Many other buildings and structures have purpose and meaning to tell the wonderful story of Herbert Hoover's life. Visitor Center - The gateway to the rest of the historic site, the Visitor Center is staffed with park rangers ready and able to answer all of visitor’s questions and help plan their day. Here, visitors can pick up a map and get information on how to download the mobile app. Activity books are available for children to help them earn the “Junior Ranger” certification. There is also a fun and education film (just over ten minutes in length) to teach visitors about Herbert Hoover and how the historic site came to be. Make sure to view the artwork from the resident artists while there as well - they change yearly and the process to apply is strict so only the best is displayed. Presidential Library and Museum - This is another main attraction on the historic site that takes about 2 hours to fully complete the experience. Another movie is offered here, this one 20 minutes in length, telling a more in-depth story of Herbert Hoover’s life. There is another art gallery on the premises as well, with temporary rotating exhibits. Although this is technically a library, there are no books to check and operates as a research facility. Materials are meant to be viewed only. Herbert Hoover Gravesite - Herbert Hoover rests alongside Lou Henry Hoover, his wife, and are both buried onsite. Two plain white marble stones stand in tribute to the wonderful actions they have accomplished in their lives. The cabin that Herbert Hoover was born in can be seen in the distance. Tallgrass Prairie Observation - 81 acres of reconstructed tallgrass prairie stretches as far as the eye can see. The National Park Service in Iowa is responsible for reconstructed native grasses, wildflowers and plants that would have been found there in the 1800s. Blacksmith Shop - Another reconstruction of the type of blacksmith and wagon making shop that would have existed at the time, the shop is actually a working “smithery” run by a park ranger and blacksmith. Come watch them work! Friends Meetinghouse - Built with the help of the Society of Quakers (a religion which Herbert Hoover was a member of), this meeting place was relocated and rebuilt in the 1960s. Visit and see a place that was very important to Herbert Hoover’s life. The Herbert Hoover National Historic Sites offers free of charge field trip opportunities to students. If a ranger guide is desired (this is recommended), they need to be reserved ahead of time. There are two options for those types of field trips - one for grades 3 through 5 and another for grades 6 through 8. Both are recommended for no more than 30 students at a time - which includes any adult chaperones - and can be adjusted to accommodate different age ranges, if needed. The website also suggests a variety of readings and curriculum suggestions to work with students ahead of their visit. Make sure to have students dress appropriately for the weather as much of the field trip will be outside. Classes can eat lunch at the park at one of the park’s picnic shelter areas. Financial and travel grants are available by application as well to help schools that may have financial difficulty. Located in the Herbert Hoover Presidential Library and Museum, the Herbert Hoover Presidential Museum Store sells an assortment of books, dinnerware, apparel and other souvenirs. All purchases benefit the historic site. There is also a separate bookstore in the Visitor Center, run and managed by the Eastern National non-for-profit company.